You know how you’re all excited about one thing only to discover something even more exciting sitting all alone over off to the side? That’s what happened when I took a look at the “Light Crust Doughboys collection” which has recently been uploaded to the Portal to Texas History site as part of the Spotlight on North Texas project via the UNT Media Library. I’m a huge fan of Western Swing and classic country music, and I spent an enjoyable hour or two watching home movies of the Light Crust Doughboys as they toured around Texas. When I looked to see what else comprised this collection, I saw the words “England Tour,” “Bruce Channel,” and “Delbert McClinton,” and a jolt went through me: oh my god, could there be film footage of the legendary meeting between the Beatles and North Texas musicians Bruce Channel and Delbert McClinton? Every Beatles fan worth his/her salt knows about the June 21, 1962 meeting when John Lennon eagerly chatted with Delbert McClinton about his harmonica prowess. I watched the 27-minute home movie (shot by Marvin “Smokey” Montgomery, member of the Light Crust Doughboys and, from what I gather, Bruce Channel’s musical collaborator and, possibly, acting manager), and it does, in fact, capture glimpses of the famed tour in which Grapevine’s Channel, riding high on his #1 hit Hey! 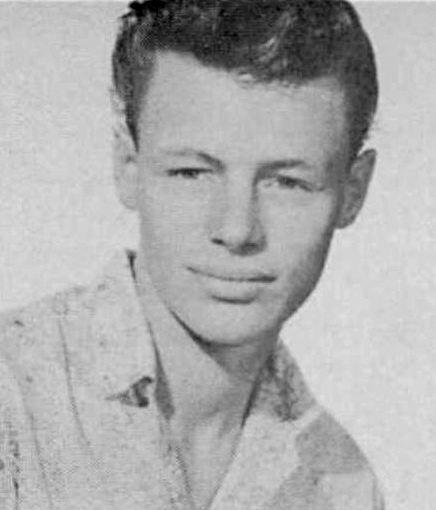 Baby, toured England with Fort Worth musician Delbert McClinton, who played harmonica on the record. One of their dates was the English town of Wallasey, just across the Mersey from Liverpool. On June 21, 1962 Bruce and Delbert played the New Brighton Tower Ballroom — their opening act was a popular local band on the brink of superstardom, The Beatles. 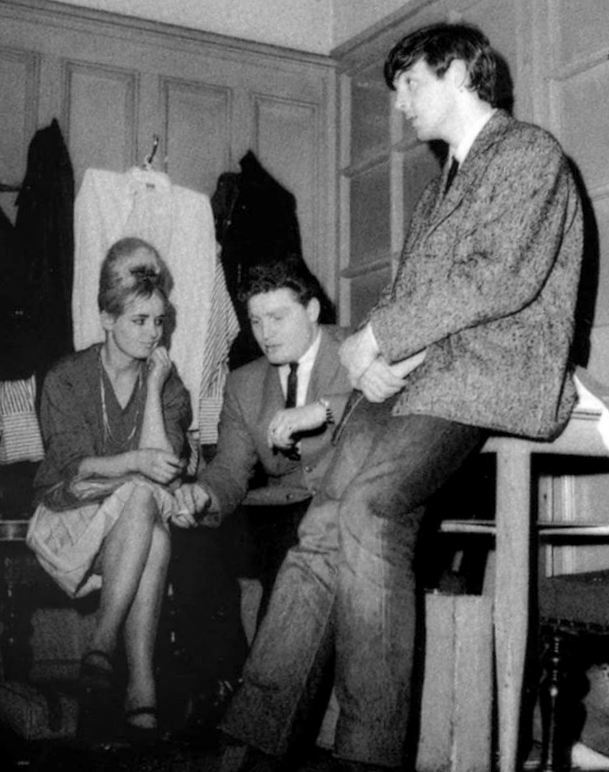 Backstage, John Lennon asked for a few harmonica tips from Delbert whose Hey! Baby sound John really liked, and Delbert was happy to share. 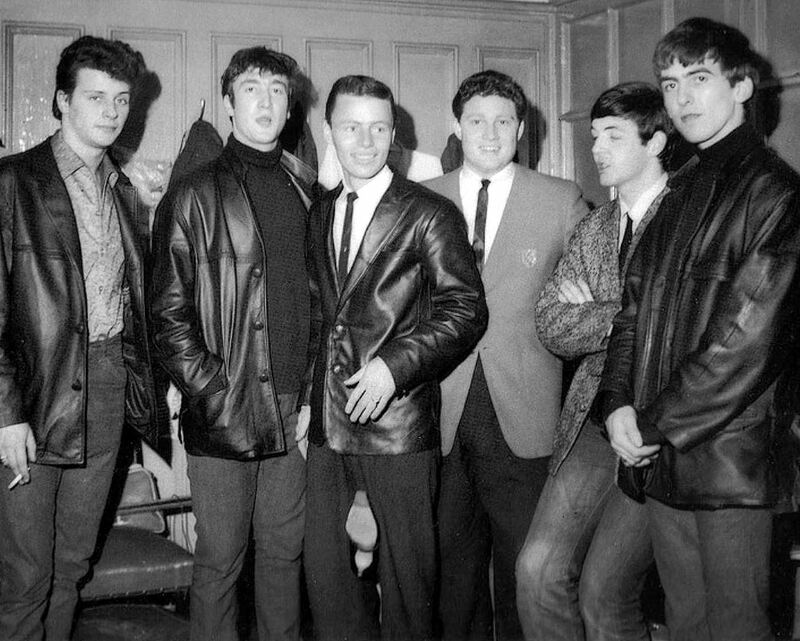 The photo above was taken at that meeting by Paul’s brother, Mike McCartney: from left to right, Pete Best (who would soon be replaced by Ringo Starr), John Lennon, Delbert McClinton (is he wearing Paul’s jacket? ), Bruce Channel, Paul McCartney, and George Harrison. 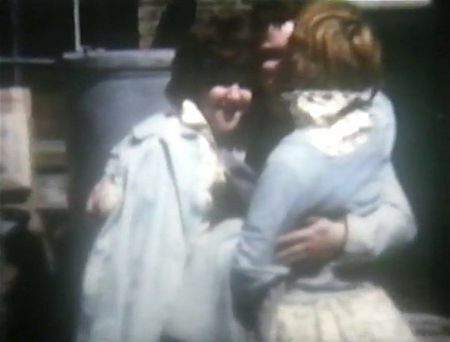 Another one, with Bruce and Paul, is below (I’m not sure who the girl is). 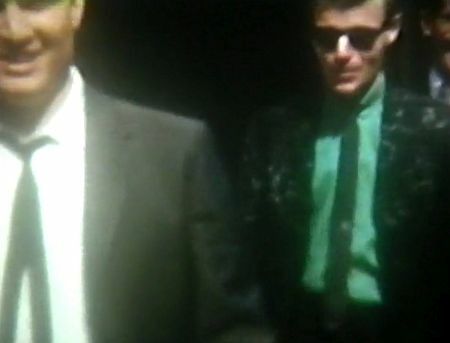 The home movie shot by Smokey Montgomery shows Bruce and Delbert (both only 21 years old at the time), their Fort Worth record producer “Major Bill” Smith, as well as several members of the package show of British performers that toured with Bruce, including Frank Ifield, Jay and Tommy Scott, and Beryl Bryden. …But, argh, no Beatles! So close! 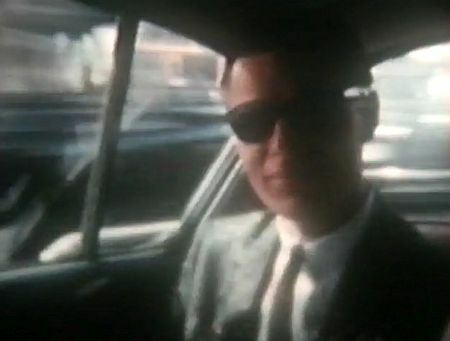 Still, this is great film footage of a famous tour — footage which may never have been seen by the public — and it is now available online for all to see, courtesy of the University of North Texas! The 27-minute (silent) film can be viewed here (the good stuff is really only in the first 11 minutes or so — the rest is mostly tourist footage of the changing of the guards at Buckingham Palace). This may be thrilling to only a handful of people, but I am definitely one of those people! You just never know what you’re going to stumble across…. Below is Bruce Channel’s monster 1962 hit, recorded in 1961 at the Clifford Herring Studios in Fort Worth, Hey! Baby, kicked off by Delbert McClinton’s distinctive harmonica. 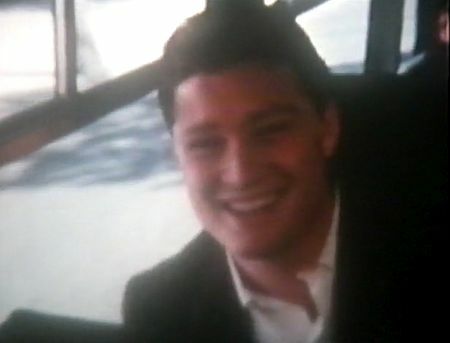 Bruce Channel (born Bruce McMeans — the “Channel” was his mother’s maiden name), was born at the end of 1940 and attended Grapevine High School. 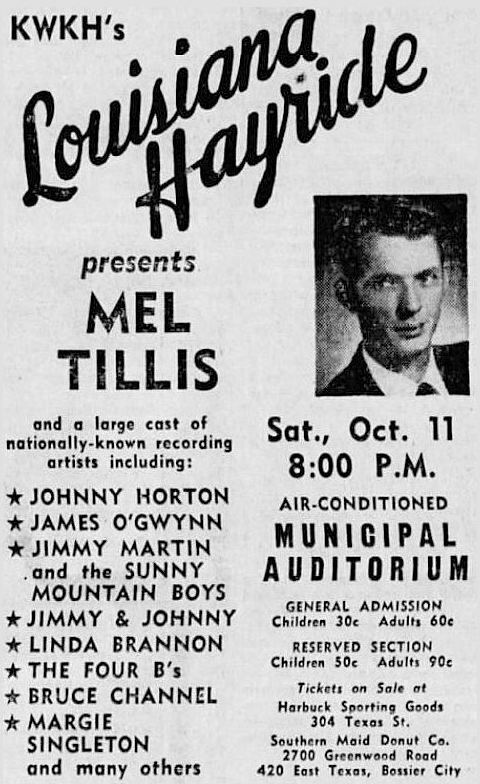 During his high school days he gained popularity as a performer, complete with lengthy commutes between Dallas and Shreveport, where he was a regular performer on the star-making Louisiana Hayride. Around this time he began writing songs with Margaret Cobb, an Irving woman who was 10-15 years older and the sister of a musician acquaintance. 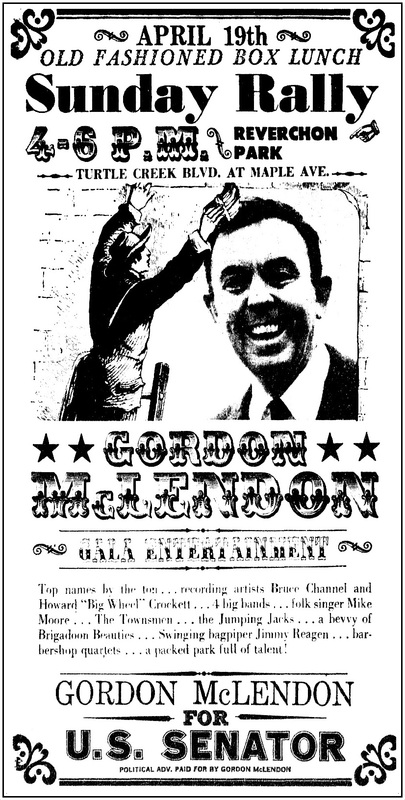 Dallas-Fort Worth-area musician Smokey Montgomery (known for decades as the banjo player in the Light Crust Doughboys) not only helped arrange those songs, but he also produced and played on some of Channel’s early singles, such as the cool (and fast!) rockabilly number, Slow Down, Baby (hear it here) and a song I like even more, Come On, Baby (hear it here). The Cobb-Channel-penned Hey! 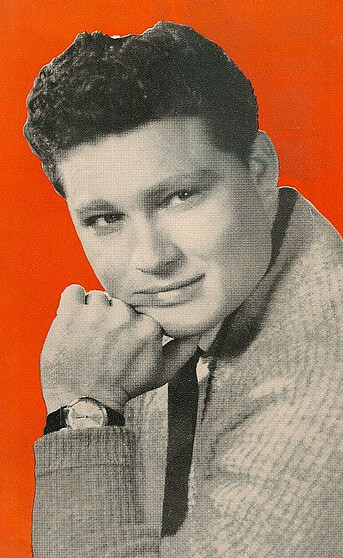 Baby was recorded in 1961 and soon became a local radio hit, most notably on KLIF in Dallas, then worked its way up charts around Texas. The song finally reached #1 in the country in March, 1962. Channel had a few other lesser hits, but none ever reached the heights of Hey! Baby. He moved to Nashville in the ’70s and embarked on a successful songwriting career. 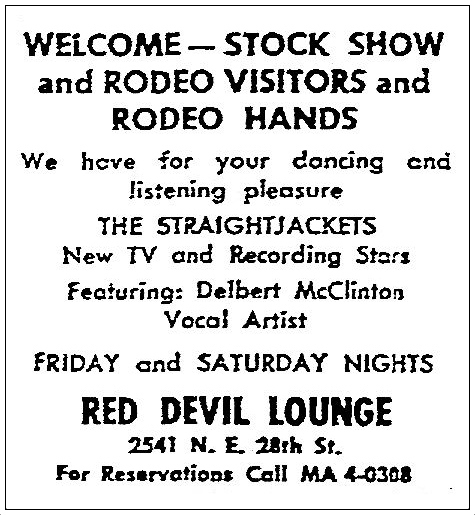 Delbert McClinton was born in Lubbock, also at the end of 1940, but grew up in Fort Worth where he, too, was a teenage musician, first gaining attention with his band The Straitjackets/Straightjackets and later the Rondels. He’s a bona fide Texas blues legend and continues to perform. 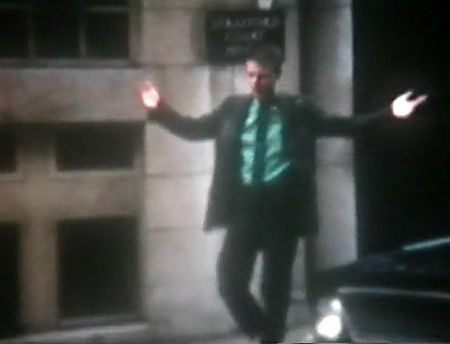 Speaking of UNT, there may also be a film clip somewhere in the Denton vaults in which Bruce Channel, the “Grapevine farmboy,” was the subject of a WBAP-Ch. 5 news story (the April 18, 1962 script is here). 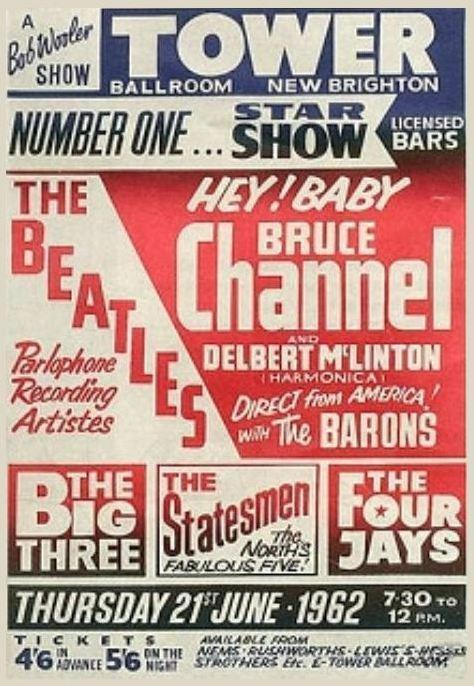 See the full printed program for Bruce Channel’s June, 1962 British package tour here. Bruce Channel’s website is here. Read an interesting interview with him here. More Bruce on Wikipedia, here. Delbert McClinton’s website is here. He’s constantly touring. Go see him! Marvin “Smokey” Montgomery is listed, along with Major Bill Smith, as a co-producer of Hey! 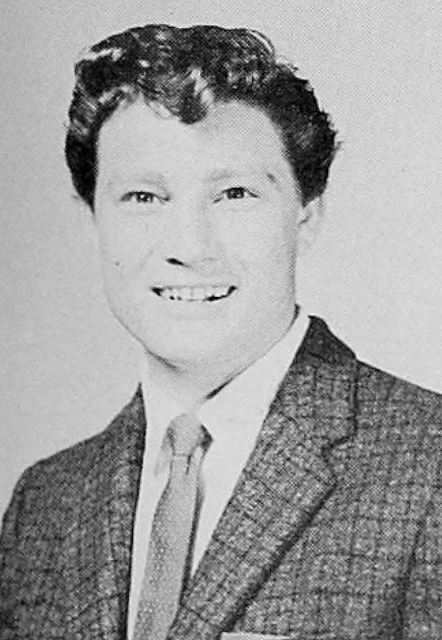 Baby, which sold well over a million copies, but it rankled him that he did not get a songwriting credit (and, perhaps more importantly, did not earn royalties), which he contended he deserved: in a 1973 Dallas Morning News profile he said somewhat bitterly, “[*Now*] if I have anything to do with making the music or writing the words… you can bet your sweet life my name will be on that record.” (“The Man Who’ll ‘Listen To Your Song'” by David Hawkins, DMN, Oct. 18, 1973). More on Smokey’s long career can be found at the Handbook of Texas, here. Read about the Beatles’ use of a perhaps Delbert-inspired harmonica sound on several of their early recordings, most notably Love Me Do, here. 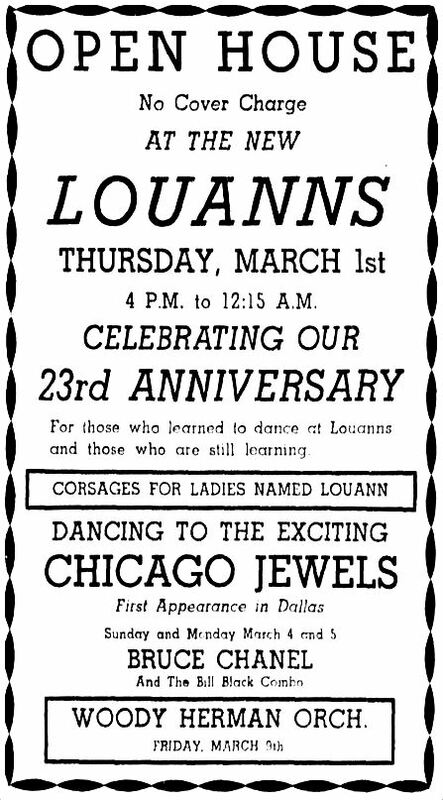 Bruce and Delbert weren’t the only DFW musicians with whom pre-Beatlemania Beatles hobnobbed: they also shared a bill in Paris with Dallas son Trini Lopez in 1963 — the Flashback Dallas post “Trini Lopez: Little Mexico’s Greatest Export” is here. Yep, I can hear Delbert’s influence in “Love Me Do”.